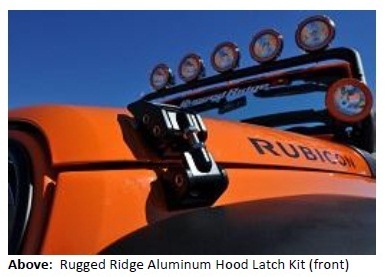 Suwanee, Ga. (October 30, 2012) – Rugged Ridge, a leading manufacturer of high-quality Jeep accessories, todayannounced the release of its all-new billet aluminum Hood Latch Kits for 2007-2013 Jeep® JK Wrangler. An age-old problem for Jeep owners, factory hood latches degradeover time and fail causing hoods to rattle or even become unsecuredwhile driving. After extensive research and countless hours of testingand evaluation, Rugged Ridge has developed its all-new aluminumHood Latch Kit to outperform where the original latches fall short.Constructed from high strength aluminum, each Kit features anadjustable tension rod to guarantee a long-lasting, precise fit on any2007-2013 JK Wrangler. Available in both stylish silver aluminum and a stealthy black powder coat finish, Rugged Ridge billet aluminum Latch Kits aredesigned to match the Wrangler’s rugged styling and legendarydurability. A simple bolt-on application, installation is performed inminutes by any do-it-yourselfer with just basic hand tools. “We saw what few options were available for JK owners to replace theirstock latches and knew we had to step in. Our goal was tooffer Jeep enthusiasts something never before available – a hoodlatch that is solid, functional and aesthetically pleasing.” saidPatrick Bennett, Product Development Manager atOmix-ADA. 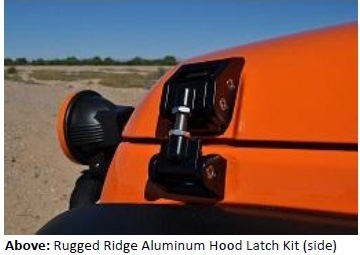 Rugged Ridge aluminum Hood Latch Kits are covered by an industry leading five-year limited warranty and are available onlineand through select Jeep and off-road parts/accessories retailersnationwide, starting at $99.99. For more information on Rugged Ridge’s complete line of high-quality Jeep and off-road products, or to find an approved retailer, please contact Rugged Ridge at(770) 614-6101 or visit their website athttp://www.RuggedRidge.com. Suwanee, GA at 770-614-6101 or visit http://www.omix-ada.com.